ThemeParkMama: Color in Kids Shirts with Giveaway! Do you have a little artist that loves to color? 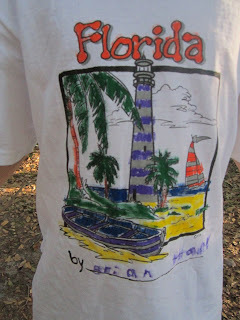 My kids are all into coloring but more so the younger ones, so how cool is it to let them color their own shirt. I went to Color In Kids Inc. site and picked out the shirts that fit each of my kids interests. I got Brian the METALLIC LIGHTHOUSE which he loves. We had just climbed the lighthouse at Ponce Inlet so this shirt was a great fit for him. When you visit Color in Kids Inc you will be shocked at all the choices you have. They even have Glow in the Dark! The best part about the color shirts is they come with the markers so everything is ready to go! You color them wash them and can color them again! They make great art projects, gifts, party favors and more! At Color In Kids, they are dedicated to making a USA made product that is fun and safe and durable. The markers are made in the USA and 100% NON TOXIC. They also donate to Hope for Autism! These are some of my other favorite shirt choices. Want one for your kid? Enter the rafflecopter below. Contest ends 04/28/13 There will be 3 winners, which you get to pic a shirt of your choice. Open to U.S. residents only. Disclosure: I was given 2 shirts from Color in Kids to help with my review. All opinions are 100% mine. I like the PIRATES ON SHIP shirt. Thanks so much for the fantastic giveaway! I would choose the BIG LOVE t-shirt for my niece! I would choose the Best Buddies. My daughter would love PEEK A BOO KITTY!